Fun fact: John and I met in Florence, Italy. Another fun fact: That city is ripe with döner kebab stands (pretty much the only thing you can get in Florence that doesn't resemble a pizza, panino or pasta...unless you count that one restaurant that serves imposter "Mexican" food). I ate lots of döner kebabs when I lived there. So much, I could be considered an amateur kebab connoisseur. In Italy, it's kebab. In Austin, Texas (and apparently Berlin), it's kebap. Now for the great debate: Is is kebab or kebap? I assume it's like a potato or 'pahtato' type thing, but who the heck says 'pahtato' anyways? Coincidence that the b is an inverse of p? I think not. Anyways, while my brain thinks up some nonsensical conspiracy theory, I'm going to stick with kebap. 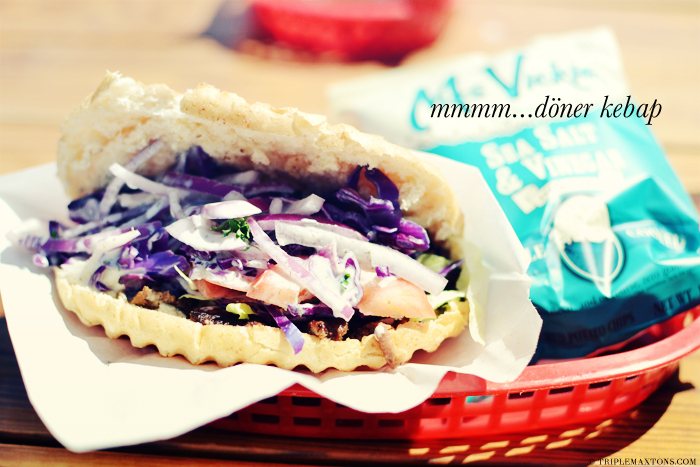 Anyways, John and I took a trip down memory lane when I took him to Verts, the home of the döner kebap in Austin. While it's not TOTALLY the same as the infamous wraps that we came to love so much in Italy, it's pretty similar and tastes darn good. Nostalgia in every bite. dahling...I have always ben a mahjor star of pahtatos and kahjbpaps...yum.